“We can't solve problems by using the same kind of thinking we used when we created them." Natalie Doud is a Designer. 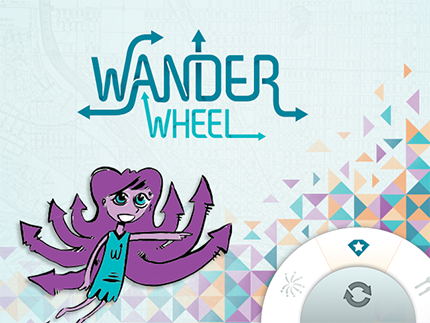 Wander Wheel is an interactive adventure-finding application I created that uses your location to create a whimsical goal-based itinerary. After winning the 2011 inaugural University of Minnesota App contest, my team revamped Wander Wheel and submitted to the Apple app store. Medjules are low-cost surgical skills trainers that provide objective feedback. The universal base allows each modular top to send skill-specific data to the cloud. Medjules are being tested within different departments at the University of Minnesota. The Choosatron is a mini-arcade kit by Jerry Belich that plays choice based stories. I designed the identity behind the local start-up project. Devil's Advocate is a destination bar in downtown Minneapolis serving meatballs and craft beer. I helped design a menu and brand that would suit the mystery-loving conspiracy-theorist in all of us.